FANTASTIC home on the LARGEST lot in the sought after, gated neighborhood of Live Oak Preserve. This well cared for East facing, 5 bed 3 bath home with designer touches offers fabulous entertaining space with outdoor seating, fire pit & JACUZZI with built in bar. Upon entering, you'll find a formal dining room & living room with wood floors, soaring ceilings & decorative lighting. Upgraded tile flooring leads you into the fabulous eat-in kitchen with stainless steel appliances, quartz island, granite counters, copper farm sink & glass tile backsplash. The kitchen flows into a large family room with hardwood flooring & custom stone wall. Tucked behind the kitchen you will find a full bath & bedroom perfect for guests. Sliders off the kitchen lead to a tranquil, screened & covered back patio. Pergolas with pavers lead you out to your substantial back yard with maintenance free PVC fencing. Upstairs features a large loft & an ample master retreat with his & her closets, master bath with stone counters, double vanities, separate garden tub & shower. A large bonus & media room & three other large bedrooms provide plenty of space on the second level. Other features include a 3 car staggered garage, large storage area under the stairs, sprinkler system, second electrical panel for outdoors. 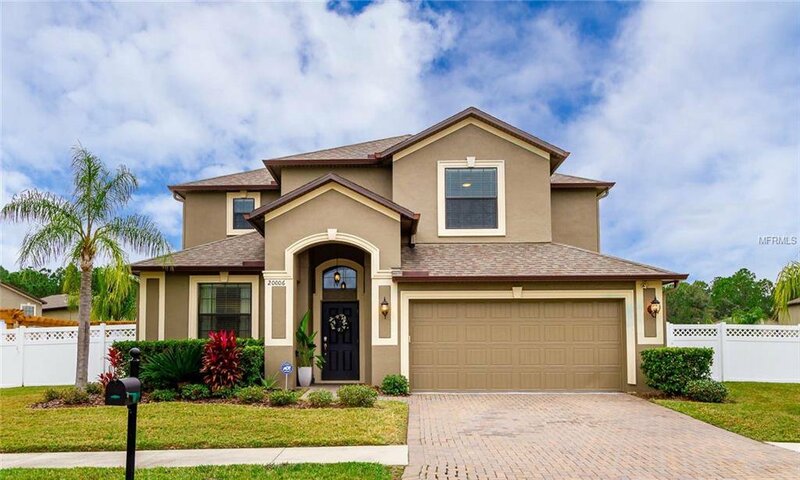 Live Oak Preserve in the heart of New Tampa features a community clubhouse with fitness center, resort style pool, tennis & basketball courts, & playground. Conveniently located near major freeways, restaurants & schools. Listing courtesy of RE/MAX CAPITAL REALTY. Selling Office: CENTURY 21 LIST WITH BEGGINS.